Posted September 13, 2013 by Green Dog & filed under carrageenan, cat health, diet and health, digestive issues, other health concerns, pet food ingredients, specific ingredients. At Green Dog, we have some rules about what food we do and don’t carry. However, sometimes there are ingredients that we learn about along the way, and when we do more research, the time comes to evaluate whether we want to keep the products that contain it. We never want to take away a popular item, but we want every food we carry to promote the health of the animals that eat it, not to undermine it. Some stores might just drop a line of products that they don’t care for, but it’s always been our policy to try hard to present the case to the company that makes the product first, to see if they might be willing to consider our request to remove the ingredient in question.Dropping the line protects our customers, but convincing a company to change the ingredient helps to protect all pets that might be feeding it nationwide, and allows us to keep a food item in stock for our customers. Hello – I’m writing today to ask about the use of carrageenan in your organic canned foods. Though I realize that the carrageenan used is “food grade” and not “degraded”, there are quite a few people advocating for a closer look into whether food grade carrageenan is in fact causing similar worrisome health effects to degraded carrageenan and whether it should indeed be used in human and animal foods at all. First, we know that degraded carrageenan is such a potent inflammatory agent that scientists routinely use it to induce inflammation and other disease in laboratory animals, to test anti-inflammation drugs and other pharmaceuticals and is also widely recognized as carcinogenic. One of our concerns is that degraded carrageenan has been shown to contaminate food-grade carrageenan. In response to a European Commission request (citation in PDF) to ensure that contamination with degraded carrageenan be kept to levels below 5%, the carrageenan manufacturers tested samples of food-grade carrageenan at six different laboratories. (citation in PDF) Test results varied widely from laboratory to laboratory, suggesting that even the carrageenan manufacturers have no reliable way of determining the levels of contamination with degraded carrageenan in their food-grade products. (citation in PDF) These tests revealed that no food-grade carageenan sample could confidently be shown to be free from degraded carrageenan at concentrations below 5%. The highest level of degraded carrageenan found in a sample was 25%. 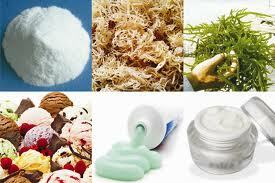 And all samples contained at least some degraded carrageenan according to the majority of laboratories. If all samples tested in the study contained degraded carrageenan above approved levels, then we might make a reasonable assumption that every canned food containing carrageenan does have some amount of this inflammatory and carcinogenic ingredient. Most owners stick to the same brand for every meal of every day, potentially for years at a time. To us, this seems like it carries a risk of accumulated affects in an animal’s smaller body. Second, some studies show some of the same negative effects of food grade carrageenan as degraded carrageenan in the GI tract, as it pertains to inflammation. In 2011, researchers at the Harvard School of Public Health wrote: “[Studies] suggest that both native [i.e. un-degraded] and degraded carrageenan may have a pronounced effect on the exertion of an inflammatory pressure on colonic mucosal cells including colonic epithelial cells and monocytes/macrophages.”(citation in PDF). In “Review of harmful gastrointestinal effects of carrageenan in animal experiments” By J. K. Tobacman from the College of Medicine, University of Iowa, it is stated “Review of these data demonstrated that exposure to un-degraded as well as to degraded carrageenan was associated with the occurrence of intestinal ulcerations and neoplasms.” Cornucopia Society states, “For humans who consume carrageenan on a regular or daily basis, the inflammation will be prolonged and constant, which is a serious health concern since prolonged inflammation is a precursor to more serious disease. In fact, the medical community has long recognized that inflammation is associated with over 100 human diseases, including inflammatory bowel disease, rheumatoid arthritis, and arteriosclerosis. Inflammation is also linked to cancer”. Third, though anecdotal in nature, there are many indications that this ingredient (food grade Carrageenan) is still causing inflammation. Many individuals experiencing gastrointestinal symptoms (ranging from mild belly bloat, to irritable bowel syndrome, to severe inflammatory bowel disease) have noticed that eliminating carrageenan from the diet leads to profound improvements in their gastrointestinal health. We at Green Dog have also seen a number of incidences, especially in cats, where animals with chronic vomiting or intestinal troubles switch off of canned foods with carrageenan onto a brand without carrageenan and seen their troubles clear up. This seems to indicate to us that this low grade inflammation is in fact present and reversible with the removal of this ingredient. In a recent Chicago Tribune article on the safety/risks of carrageenan, the Tribune asked the international trade association representing producers of carrageenan if they were aware of any peer-reviewed scientific research that supported the safety of carrageenan but wasn’t performed by industry-funded scientists. Three weeks later, no such science was produced. In fact, a 2006 rat study that is used as the “gold standard” to prove the safety of carrageenan and is used as the foundation of the FDA stance that carrageenan is safe was performed by a manufacturer of carrageenan. One might hope that there would be at least one independent study done to help to verify the safety of this ingredient. (If your company knows of one, we would be very interested in seeing it). Lastly, we think that the industry trend seems to really be headed towards more carrageenan-free canned foods. Whether this is in response to these sorts of studies, or simply in response to public perception and pressure, it is happening. Sales reps from a number of companies are leading with the fact that their cans are carrageenan-free when they are introducing can lines to us. I worry that your company might be falling behind this trend, when they could be leading the industry in the removal of this controversial ingredient, in accordance with the recommendations of the Organic Consumers Association and the National Organics Standards Board. We hope you might consider a different thickener that doesn’t come with the controversies surrounding this ingredient. The Results: The great news is that this company agreed with us and has made the decision to remove the Carrageenan from their canned foods ASAP – they are in the process of reformulating. The product we mentioned that we were looking at but don’t yet carry also agreed that it would be advisable to remove it from their products, starting almost immediately, but that the label would still reflect the old formulation until they ran out of labels. (pet food companies have 6 months I believe to change labeling when they change a formulation). The big company I mentioned had a fairly good response for such a big company, in that when they received our letter they actually stopped production of a new line of canned foods and reformulated them to be carrageenan free. They are in discussion about what to do with their older lines of pate style canned foods though, as the removal of the carrageenan can affect the mouth-feel of the food, so palatability might be affected. They’re in discussions internally as to how to reformulate. We are eager for them to do this but realize that it might not happen, or may take some time, but we want to support the steps they’ve taken so far to address the issue. However, this is problematic for us, as we sell so much of it, so we may make a shorter version of this letter to give customers who feed it, to see what their response will be – asking them outright whether we should discontinue the product, or at least let them choose whether to continue feeding it. (Note: this company was Wellness Pet Food, and they chose not to take carrageenan out of all of their cans. We discontinued the line.) The last company we mentioned never responded, which is typical of their lack of communications in the past over similar questions. We therefore discontinued that cat can line and will do the same with the dog food line, after breaking the news to our customers. So what do you think? Would you continue to feed a food that contained carrageenan? If you shop with us, do you think we should pull all cans that contain it even if it’s your favorite? We encourage you to look at your canned food or chewy treat to see if it contains carrageenan, and contact the company to let them know you wish they would discontinue the use of this ingredient. We love that you guys are so pro active for us as consumers. We spend ALOT of money on the food we buy our dogs because we are trying to avoid health issues later in their lives. One is 60 lbs and one is 10 lbs. We have used Merrit and are currently using Wellness. We trust your decisions. Please let us know what you will have available that does not have this ingredient it. Thanks for looking out for our babies. Currently, I feed my cats raw and when they get picky I’ll pull out a can for a day or two. Given your research, if I was feeding strictly canned that contained carrageenan, I think I would try rotating food more frequently, especially if I had very finicky cats. With that in mind, I would probably want you to continue carrying a brand that was popular at least until I could find another food my cat would eat. Thanks for those comments! Mary – most of the cans we carry do not contain it – in fact, Merrick and Wellness are the only 2 that do have it, and the rest do not. We have had a policy not to bring in new cans that have carrageenan for years, but the old standbys are a tough call. Jeanne – thanks for your feedback. I agree that rotating foods is the best way to avoid problems with foods – much less risk of feeding something that might have too much or too little of something for your individual pets. I agree – we will be starting a program soon that will target Wellness and Merrick customers with educational pamphlets about Carrageenan, and see what the feedback is. Cats are often so addicted to one food that we don’t want to yank products out without notice, but we also would like to motivate those customers to try other products. Merrick has been so non-respnsive to our inquiries though that we did pull the cat cans, and are considering it with the dog cans, despite their popularity. Do you have a list of wet dog foods that do not contain carrageenan? I’ve been feeding my puppy Wellness dry mixed with some Wellness puppy canned. I just noticed the canned has Carageenan in it. Is there another canned puppy food you recommend wihout it?